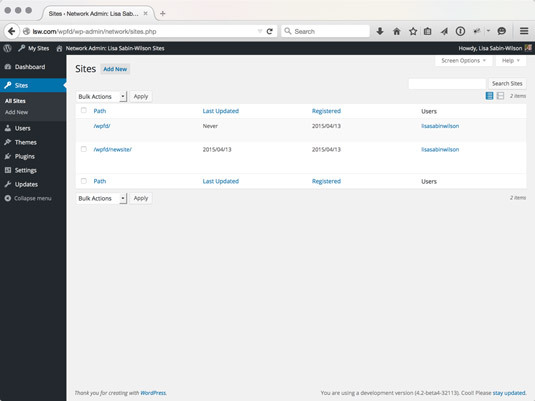 Clicking the Sites menu item on the Network Admin Dashboard takes you to the Sites page in WordPress, where you can manage your individual sites. Although each site in the network has its own Dashboard for basic tasks, such as posting, changing themes, and so on, the Sites page is where you create and delete sites and make edits to properties of the sites within your network. Editing information from this page is handy when you have issues accessing a site’s Dashboard. Path: The site’s path in your network. For example, you see a site listed with the path: newsite. This means that the site’s domain is newsite.yourdomain.com if you are using a subdomain setup, or yoursite.com/newsite if you are using a subdirectory setup. Last Updated: The date the site was last updated (or published to). Registered: The date the site was registered in your network. Users: The username and email address associated with the user(s) of that site. Individual site management options on the Sites page. Edit: A link to the Edit Site page, where you can change aspects of each site. Dashboard: A link to the Dashboard of the site. Delete: Click this link to delete the site from your network of sites permanently. Although you see a confirmation screen that asks you to confirm your intention to delete the site, after you’ve done it, you cannot reverse this decision. Visit: Click this link to visit the live site in your web browser. Info: Under this tab, you can edit the site’s domain, path, registered date, updated date, and attributes (Public, Archived, Spam, Deleted, Mature). Users: Under this tab, you can manage the users that are assigned to the site, as well as add new users to the site under the Add New User section. Themes: Under this tab, you can enable themes for this site. This capability is particularly useful if you have themes that are not Network Enabled because all the themes that are not enabled within your network are listed under the Themes tab, which allows you to enable themes on a per-site basis. Settings: The settings under this tab cover all the database settings for the site that you are editing. You will rarely, if ever, need to edit these settings because as the Network Admin, you have access to each user’s Dashboard and should be able to make any changes to the site’s configuration settings there. If the Admin Email you entered is associated with an existing user, the new site is assigned to that user in your network. If the user doesn’t exist, a new user is created and an email is sent with a notification. The site is immediately accessible. The user receives an email containing a link to his site, a login link, and his username and password. The Add New Site page on the Network Admin Dashboard.